I've experienced exchange program with Temasek Polytechnic in Singapore when I was in college school. Every Temasek student were all welcomed us with wearing same red T-shirts. Temasek Polytechnic is built in 1990, and now they have 15 thousand students in this school. There are many kinds of subjects are established in this school, science, economy, engineering, humanities, social science and information etc..
We have a relation between engineering course with this school. 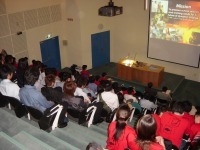 We were divided several group, and toured around the school by the Temasek students. 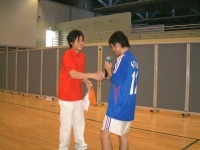 We enjoyed introduction and sports event with them. 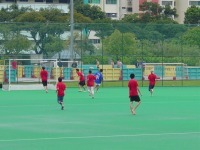 This picture is international soccer match held with Singaporean students VS Japanese students. Left hand picture shows which I scored 1 goal. And right hand picture is gathering picture with Temasek students. We only have few female students in my college, and sadly we spent school life withought girls. I think all KIT students were really enjoyed staying this time, because we can spent time with Temasek female students there. At last I did farewell speach to the Temasek students. I was really gratitude to everyone for preparing this event and kind treatments. 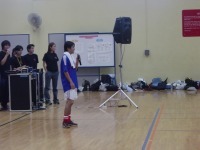 I hand shaked with Alan whose leader of Temasek student. I couldn't imagined at this time witch we'll meet in my city (Fukuoka) next 5 years later. I felt like friends is treasure of life. If I have chance to visit Singapore again, I'll definitely visit him again.